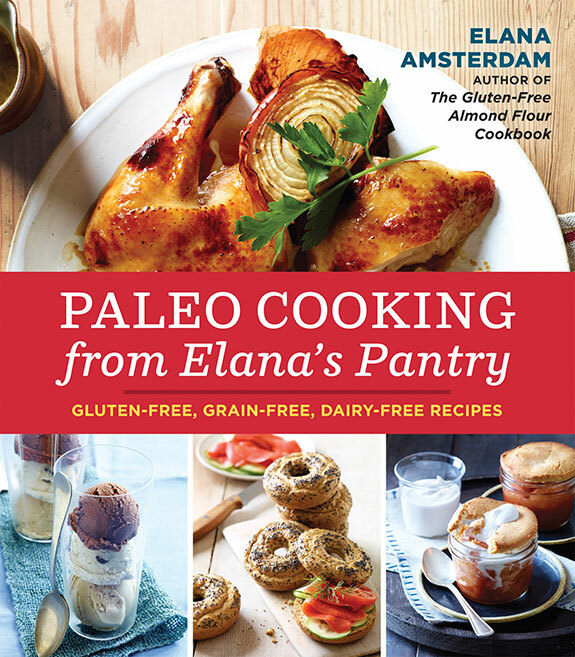 Although I did not make a big fuss when it came out, I remain beyond thrilled with my third book, the New York Times bestseller, Paleo Cooking from Elana’s Pantry. This labor of love is the culmination of almost a decade of cooking simple, healthy, and most important, tasty food for family, friends and the millions of people that read my blog. While there have been a flood of Paleo cookbooks that hit the market in the last year, my readers have told me that a couple of things set the recipes in this book apart from others. First, simplicity. My recipes use as few ingredients as possible. No long lists of different flours! As a busy mother of two boys I don’t have time to waste, and I know you don’t either. Second, the recipes are fail safe. All of the recipes in this book (as well my others) are professionally tested by a paid recipe tester, that is, after they are tested by me. After I perfect a recipe, it is tested by paid assistants who are not professional chefs (to make sure that beginner cooks can understand and make it) then off to the professional tester my recipes go! I’ve never discussed this before, but I thought you would like a bit of detail on the “making of” my books. The recipes work because I work them over, and then a couple of other people do too! Additionally, my recipes are healthy. My third book Paleo Cooking from Elana’s Pantry has more than 90 recipes –all are gluten-free, grain-free, dairy-free, and nightshade-free! Of those recipes more than 60 are nut-free as well. After writing my first book, The Gluten-Free Almond Flour Cookbook, I wanted to write a book that would be more inclusive of people with different allergies, that is why more than two-thirds of the recipes in Paleo Cooking from Elana’s Pantry are free of nuts. With everything from Paleo Pad Thai to Paleo Shepherd’s Pie, you’ll find fantastically tasty easy dinners as well as simple, easy desserts such as these adorable Upside-Down Apple Tartlets. While I put my heart and soul into writing Paleo Cooking from Elana’s Pantry, I did next to nothing to promote it. Why? First, I’m much better off staying home and sticking to my health routine than I am going on the road. Although I haven’t mentioned it here, I’m also really shy, and a much better writer than shmoozer. I don’t do well in big groups of people and get a bit overwhelmed. In fact, I’m pretty bad at networking and self-promotion. Finally, the summer the book came out I moved my family to our new house and threw a Bar Mitzvah for my younger son. This book, my third, got lost in the mix of all my family endeavors. So, as we Jews say, this is my little spiel for this cookbook, which although a New York Times bestseller, received little of my attention (and promotion) after its creation. I hope you enjoy this recipe for Paleo Upside-Down Apple Tartlets, which gives you a little peak into Paleo Cooking from Elana’s Pantry! I’m often asked why we use a small format for my cookbooks. I intentionally ask my publisher, Random House, to make the books small so that they are inexpensive and easy for people to afford. Of course, this cuts down my profit margin, but it saves you money and this smaller format also saves trees. Thankfully, the book is very affordable –it’s usually sold on amazon for somewhere around $12.00 (sometimes a bit less, sometimes a bit more, amazon sets the price, and I have no control over that). My goal is not to sell books. My goal is to help people. That’s why there are 800 free recipes on my website for all of you to enjoy! I advise you to try the free recipes first, rather than buying my book. If you love them and get through them all, the books are waiting for you! Tried making the dough for these– twice. Failed– twice. Dough will not form a ball ? Love the crust part that I have made this into a cookie! Using all the same ingredients plus vanilla powder, 1/2 tsp of powdered stevia, cinnamon, I process in the food processor till well blended. I scoop it all in a bowl, and then with my cookie scooper make the cookies baking them on parchment paper til very brown. I have tried some of your recipes and have like what I have tried. My problem is eggs as well as dairy, soy, nuts, gluten and grains in general. Do you have very many recipes with no egg? Kristie, here’s a link to my Egg-Free Recipes page for you! Elana, thank you sooooo much for all these amazing recipes! they really truly are awesome. i am a 14yr old girl, and i do all of the baking in my house. my dad, brother and one of my sisters are gluten intolerant, and possibly have Celiac disease. you’re recipes make it possible for to still enjoy baked treats together, in a way that’s better for all of us. Thanks a million for making that happen. I hope i can help people like that someday too. Hi Elena, I have all your cookbooks and love them I just wish instead of 6 apples you could indicate how many grams it would be. The same applies to carrots, eggs, etc. Hi Linda, thanks for your comment. Providing measurements by weight is something I’ve thought about for quite some time, so your feedback is very helpful. So glad to hear you are enjoying my cookbooks! Hello, Elana. I am very attracted to the apple tartlets recipe. I’ve baked “pina colada” cakes in the past in pint Mason jars with success (not paleo). About the blanched almond flour: I wonder if you have had occasion to assess the economics of processing blanched almonds into flour, using the Vita-Mix. Thanks so much for those Passover recipes. So easy when we should be enjoying this time of renewal.